You need a mold that’s fast growing. Rapid, fibrous growth. That’s the ticket. Next you need a mold that secretes a bucket-load of enzymes. Nice. You also need a mold that doesn’t stink up the joint. Something sweet and flavorful. Perfect. And lastly you need a mold that keeps its environs sparkling clean and free from unwanted debris. Beautiful. Now you’ve got your mold. You’ve narrowed it down to something called Aspergillus oryzae by white-jacketed Latinists, or kōji-kin by food- and drink-loving populists. For the record it’s also the National Fungus of Japan as declared by the Brewing Society of Japan. A. oryzae or kōji-kin just happens to be the kingmaker ingredient in rice vinegar, soya sauce, miso and the not-so insignificant multi-billion dollar world-wide sake brewing industry. Hence the Brewing Society’s heady accolade. Domesticated in China more than two thousand years ago (around the same time the camel was first put under leash in Africa), A. oryzae and its hairy-legged, hump-backed very distant cousin have been put to work in the service of Homo sapiens ever since. But in much different capacities, of course. Most everyone knows that sake comes from rice. But it’s definitely not a straightforward process. In order to ferment rice, the grain-starch must first be converted into sugar. Unlike the raw materials of wine (fruit juice) and beer (malted barley) that already contain sugar, rice needs the sweet, hothouse embrace of kōji-kin to get the fermentation rolling. One part science, one part incantation, kōji-kin is quite literally the sake brewmaster’s magic dust. Under special conditions rice inoculated with kōji-kin becomes the hybrid product known simply as kōji. The meticulous and secretive way in which kōji is produced lies at the heart of premium sake production. I wanted to know more about sake and visited Ken Valvur, owner-operator of Ontario Spring Water Sake Company located in downtown Toronto’s Distillery District. The footprint of the storefront/brewery is an odd-angle polygram of historic limestone brick walls just off the District’s main promenade. Valvur was hands-deep behind the scene, easily mistaken for the hardest-working member of his staff. A crowd was gathering near the tasting counter for a tour of the premises. Busy place. Valvur soon emerged from the brewery side of the operation, separated from the showroom by a tall glass partition. Nothing to hide here. Just the owner of the company, in work clothes, tying up some loose ends on a Saturday afternoon. We spoke for about 15 minutes before trying some of Ontario Spring Water Sake’s finest. A welcome, cooling reprieve from the humidity. 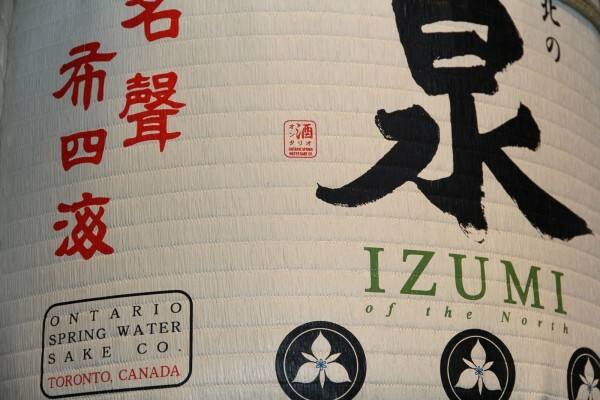 Turns out that world-class sake production in Canada is very much a global affair. Valvur sources kōji-kin from Japan, Commission-certified M202 rice from California, and crystal-clean water from…you guessed it…freshwater springs in Huntsville, Ontario (the chemical properties of which are similar to the famous Fushimi wells south of Kyoto). Brewed on site, all of these elements go into the finest sake around. In fact, freshly pressed, unpasteurized and unfiltered sake isn’t manufactured anywhere else in Ontario or the eastern seaboard. But don’t worry, it’s available in many of Toronto’s finest restaurants as well as more than 100 LCBO stores in Ontario and select SAQ outlets in Quebec. All of the brewery’s sake and a wide selection of related products are also available for purchase at the tasting counter. Ontario Spring Water Sake began operations in February 2011, not too long after Valvur made a preparatory (read: experimental) stab at sake production in his basement. He had been seduced by the beverage after trying unpasteurized and unfiltered sake from a freshly pressed tank while in Japan. But that’s a long way to go to enjoy premium sake. He knew that the only way to get it back home was to make it himself. Valvur sought advisory assistance from the venerable Miyasaka Brewing Co., Ltd. (400 plus years in the business) and award-winning master sake brewer Yoshiko Takahashi from the Nagano region of Japan. Now, well into year three of production, things are looking up. Sales are brisk and the on-site tasting counter hosts thousands of guests a year. Proves that hard work, talent and a little magic dust can go a long way. Ontario Spring Water Sake Company Head Brewer Greg Newton was guest speaker at the First Annual Nikkei Voice Sake & Sushi Night on June 4, 2013.